Digital Certificates can be used to encrypt email and digitally sign messages. Since nearly all email is sent unencrypted, any one with access to one of the dozens of servers, routers, and network providers that the message travels across can intercept, read, and modify any such message. Encrypting and signing messages can help assure one’s privacy and to authenticate that the sender of the message is who they claim they are, and that the message was not modified in transit. This may sound complicated, but it’s actually very easy for an average computer user to set up and use. If you’re comfortable with browsing the internet, filling out forms, and following directions you should be able to complete these instructions in about 10-15 minutes with no trouble. Digitally signing an email proves authorship and prevents tampering, assuring the email recipient that the email came from you, not an imposter, and that the content of the email has not been altered in transit. Encrypting email ensures message privacy and keeps sensitive information from falling into the wrong hands. 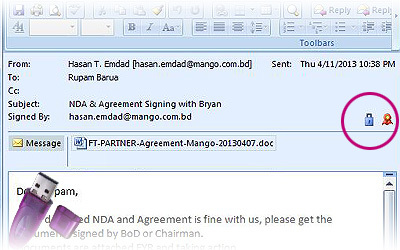 Secure Email is achieved using Mango CA Digital Certificate solution using a Class-1 or Class-2 Certificates for individuals or Enterprise users. Our Certificates are cryptographic signing certificates that bind your verified, physical identity to the certificate so recipients of email messages can verify that the email actually came from you. Seamless Integration with USB PKI Token. Mango CA’s Class-1 and Class-2 Certificates employ the Secure/Multipurpose Internet Mail Extensions (S/MIME) protocol to digitally sign or encrypt emails. S/MIME Encryption provides message integrity, authentication, privacy via data encryption, and non-repudiation via digital signatures. Most mail clients support S/MIME, such as Microsoft Outlook, Thunderbird, Apple Mail, Lotus Notes, and Mulberry Mail. Please ask our support to learn more on your support ability of you mail client for using Digital Signature.